PHOTRON says its new FastCam Mini AX100 high-speed camera is the fastest, most light sensitive high-speed imager available. The camera achieves ISO 40,000 for monochrome and ISO 16,000 for colour. 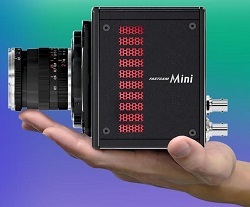 Measuring only 120 x 120 x 94mm, the Mini AX100 resolves 1024 x 1024 pixel images at up to 4000 frames per second (fps). Higher frame rates can be achieved at lower resolution. For example, 10,000 frames per second are delivered at 768 x 528 pixels, 20,000fps at 384 x 384, and so on up to a maximum 540,000fps at 128 x 16 pixel resolution. Weighing 1.6kg, this one-piece camera joins the recently introduced FastCam Mini AX50 to deliver high frame rates with excellent image quality, says the company.